There are more than 40 accessible sites in the Angkor Wat area. The following selections highlight the most interesting as well as the most commonly visited. If you need help sorting through it all, here's some very rudimentary advice: You must visit the temples of Angkor Wat and the Bayon, or you haven't even been to Angkor. You should take in Banteay Srei, Ta Prohm and Preah Khan to appreciate the full range of the monuments. If you want to see 'what nobody else sees' then take the time to get to Kbal Spean and Beng Melea. There are few places to avoid, but Phnom Bakheng is probably one of them. So many tourists flock up the hill to watch the sunset that it's seriously degrading the few remains of the monument. For detailed advice, see my full page on planning your trip to Angkor. The fertile lands of Southeast Asia have been inhabited since Neolithic times. Around the first century AD, the area became a crossroads of trade between the sub-continent and China. The Indians greatly influenced all aspects of the local culture, introducing the great religions of Hinduism and Buddhism, as well as the basis for the modern language. The first millennium saw the emergence of great city-states which began to evolve into kingdoms and empires. Among the greatest of these was the Srivijaya empire based in Java, which at its height held influence over most of Southeast Asia. Around 790, a Khmer prince returned from a long stay at the court in Java - whether he was there as a guest or a captive isn't clear. This young man became a great warrior who managed to subdue several competing Khmer city-states and declared a unified 'Kambuja' under a single ruler. In 802, this prince declared himself King Jayavarman II in a ceremony on Kulen Mountain. The first capital of the new empire was near the present-day town of Roluos, although there was a brief period around 802 when it was based in the Kulen Mountains. After his death, the next king, Indravarman III built one of the first major temples of Roluos, Preah Ko, in Jayavarman's honor. The next king, Yasovarman I, built the temple atop Phnom Bakheng, and moved his capital there in 893, creating the city of Yasodhara-pura. Except for a brief 20 year exception, the capital of the Khmer empire remained in the same area for the next 500 years. Around 1177, the Chams (from present-day Vietnam) sailed up the Tonle Sap and attacked Angkor, sacking and occupying the city. They stayed on for four years, until the now legendary Jayavarman VII mounted a counter-attack and finally drove out the chams in 1181. Jayavarman VII was named king after he expelled the Chams. Unlike previous kings, he was Buddhist rather than Hindu, and made Mahayana Buddhism the state religion. He also undertook the most ambitious period of monument building that Angkor had ever seen. Hundreds of temples and other monuments were built during Jayavarman VII's 40 year reign, including the Bayon, in the middle of his new royal city, Angkor Thom, as well as the temples of Ta Prohm, Preah Khan and Banteay Kdei, but he didn't build Angkor Wat. The greatest of all the temples at Angkor was built by Jayavarman VII's predecessor, King Suryavarman II, earlier in the twelfth century. This huge royal precinct just north of Angkor Wat is home to perhaps the most enigmatic Khmer temples, the Bayon. This huge temple, by which most people know the whole complex, was built around 1150. It is now such a part of the national identity that it figures on the Cambodian flag. A small pyramidal temple between Phnom Bakheng and Angkor Thom. Banteay Kdei was yet another temple built by the great King Jayavarman VII. It is similar in design to Ta Prohm although much smaller, and like Ta Prohm, Banteay Kdei is largely un-restored. The Angkor Wat era temple of Banteay Samre lies just outside the eastern wall of the eastern baray. When it was built, around 952, the East Mebon must have been quite impressive. The pyramidal structure consists of three concentric tiers crowned by five towers. It is a typical motif of many Angkor temples, which seek to represent Mount Meru, the location of the Hindu "heaven". It must have been highly symbolic, rowing a boat across the lake to one of the temple's four landings, then climbing up the tiers to pray at the shrines. Krol Romeas is the only ruin in Angkor that isn't a temple. What is it? Nobody knows for sure. Neak Pean is perhaps the most unique temple in the Angkor complex. It was built in the second half of the 12th century as a sort of spiritual and physical hospital. This small temple consists of a platform supporting three small towers. A small temple with a rather dull exterior, but with some of the best preserved bas-reliefs at Angkor. Pre Rup was built around 961, just a few years after the similarly designed East Mebon and located just to the south. The temple is built on a grander scale than the East Mebon, and is perhaps the best example of the temple-mountain style of structure. Like Ta Prom, Preah Khan is still largely in the embrace of the jungle, but it is in the process of being restored. If you're interested in how this is done, you can see the process in progress at Preah Khan. Standing just outside the eastern gate of Angkor Thom, Ta Keo isone of the great temple-mountains of Angkor. We recommend this late-11th century temple as the place to start. The unrestored complex is still overgrown by jungle and massive trees. It gives you an idea of the state most of the other temples were in when restoration started around 100 years ago. This tiny temple was also built by Jayavarman VII around the end of the twelfth century. Although more or less unrestored the temple is still in very good shape, with some very fine details. The Thommanon is a small temple just a short distance outside the eastern "Victory" gate to Angkor Thom. It is one of a pair of temples more or less identical in plan on opposite sides of the road. Located away from the main complex, this small temple built of pink sandstone is perhaps the most intricately carved and beautiful of the temples. The remote temple of Beng Melea has only recently been opened and feasible for tourists to visit. Up on Kulen mountain, about 50 kilometers from Siem Reap, a natural stone bridge crosses one of the small streams that pour out onto the plain below. From this bridge, and for about 100 meters downstream, the ancient Khmers carved linga images into the exposed stone riverbed. 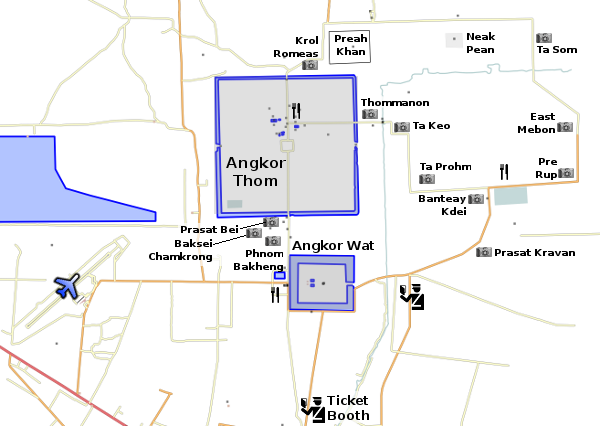 Before Angkor Wat was built, before the Khmer capital was was moved to the area around Phnom Bakeng, the center of the kingdom was located around the present-day village of Roluos. For a break from viewing the temples, make a trip to this huge inland sea. Many people mistakenly under-estimate the size of the temple complex of Angkor. Its not realistic to expect to walk between the temples. At the very least, you'll want a motorcycle. Given the size of the complex, a knowledgeable guide will greatly add to your experience of this huge city of temples and palaces. See the Getting Around page for more information. All visitors to the Angkor Archaeological Park must purchase an admission pass at the main entrance on the road from Siem Reap into the park. The pass must be shown to the temple guards (wearing blue shirts) at every temple within the park, as well as some of the outlying sites. The cost of the pass is US$37 for a one-day pass, US$62 for a three-day pass, and US$72 for a seven-day pass. They will take a photo of you at the entrance booth, which will be affixed to the entry pass. Note that as of October 2017, plans have been announced to allow you to pay the fee with a credit/debit card.